JIMS Rohini congratulates Dr. Neelam Dhall and Mr. N.P. 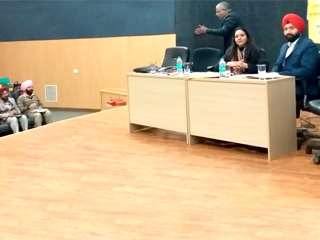 Singh faculty, JIMS for conducting one-day Management Development Programme on ‘Enhancing Group Discussion Skills’ for Senior officers, Punjab and Sind Bank on 12th January’2019 at their Staff Training College, Rohini. 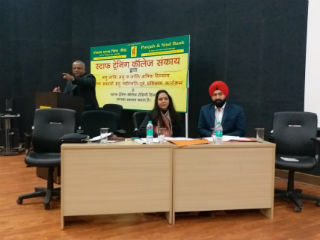 Since the MDP was intended towards Pre-Promotion Training of Senior officers, Punjab and Sind Bank, about 150-200 Senior Bank officers from all over India participated in the programme. As part of the MDP, a number of GD (Group Discussion) groups comprising Senior officers were prepared and several mock GD sessions on contemporary themes relevant to the banking sector were conducted. During mock GD sessions, the resource team prepared a comprehensive performance report for each participant, which included some key observations and individual scores on various parameters. Subsequently, a feedback session was held where the resource team shared the performance report with each participant. The feedback session not only sensitized the participants to their strengths and weaknesses but also triggered lots of queries and dialogue. The resource team concluded the programme by sharing few GD Tips & Tricks with focus on communication skills, body language and behavioural aspects. Overall, the programme was highly appreciated by the participants and the Training officials at Punjab and Sind Bank.